Naked is found primarily in hotels seeking to offer a high quality of experience expressed through interiors, such as those once easily categorized as boutique or concept hotels. Naked hotel bathroom designs exist as a result of several strategies. These strategies inspire the practice, and they are not exclusive of one another. Naked can be a manner of appreciating and elevating the design and form of everyday objects, a way of challenging precedent and social norms, a means of making a smaller room appear larger, and an approach for taking advantage of natural light and views. Naked is strategic in all of its iterations in that it offers guests a designed experience unusual to what they would commonly have in their homes. This, of course, is not a new concept for higher-end hotels. They most often offer the allure and theatricality of being able to live more lavishly than one normally does for a day or two - a concept that came about in the early 19th century with the advent of the grand hotel typology. In seeking to differentiate themselves from other hotels, though, concept hotels must push this idea further than simply offering luxury appointments and services. Naked is one manner in offering something different, and at times it can be shocking. 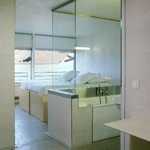 In the case of Tokyo's first boutique hotel,4 Hotel Claska (2004), the bathroom of Room 505 features a fully transparent all-glass wall, revealing the otherwise traditionally contained and arranged bathroom to the bedroom.5 All visual privacy is lost, because the toilet is also not concealed to the room. This design introduces an element of voyeurism and challenges the guest's comfort level. The gimmick is successful, and it certainly gains the attention and publicity needed for any boutique hotel to survive. In a more practical sense, Naked can increase the perceived spaciousness of a hotel guestroom and bathroom, a practice especially seen in urban environments where hotel rooms are generally smaller. This can be achieved in the manner that an enclosed bathroom features transparent walls, so that the bathroom and bedroom appear to be harmonious components of one larger, connected space rather than two separate chambers. This is seen in London's Sanderson Hotel (2000) that features a vitrine-like6 enclosed bathroom containing the lavatory and toilet, the bathtub is placed just outside.7 Ordinarily a bathroom situated as such would visually divide the room, here, though, one is able to look right through the bathroom as thought it were almost not there. In a similar vein, Naked can increase the overall space of the bedroom/living area in a suite by reducing the footprint of the bathroom through drawing out features such as the bathtub and the lavatory and situating them within the scheme of the bedroom/living area. The toilet, then, is the only component needed to be completely compartmentalized and it takes up very little space; circulation space normally given to the elements in an enclosed bathroom is then given to the traditionally non-bathroom space. The archetypical practice of a complete bathroom needing to consist of a bathtub, a toilet, and a washbasin (later a lavatory) was first recorded as being designed in 1811 by Benjamin Latrobe for a residence in Philadelphia, Pennsylvania.10 This was the first instance of the three-piece sanitary suite that later became the standard both in residential design and in hotel design. Hotels did not feature individual bathrooms with shower, toilet, and lavatory for each room until the 20th century. Before then, plumbing systems were not advanced enough to handle the demand of so many individual bathrooms, therefore, hotel bathrooms were shared by guests. The Ritz in London is credited as being the first European establishment to have a bathroom for each guestroom in 1906, and the Statler Hotel in Buffalo, New York was the first American hotel to do so in 1911.11 This model soon became the standard for the hotel industry and developed into an expected accommodation in subsequent decades. The bathroom within the hotel suite retained its own enclosed room until the 1960 decade in the United States when several variations began to emerge for the sake of efficiency and privacy. The enclosed bathroom, though, presently remains the global industry standard. That same year, Emily Malino's projection of the hotel-motel "Room of Tomorrow" for the National Hotel Exposition at the New York Coliseum featured a similar bathroom arrangement. Her room, though, featured a full bathroom that could be closed off from the rest of the suite with an additional lavatory outside of the bathroom.15 She was correct in predicting that a bathroom with an exterior lavatory would become popular; however, it was primarily in the motel sector of the hotel business. During that same convention, Larry E. Seitz, president of Hotel Design, Inc. (a division of Motel Enterprises, Inc.) presented a typical plan and cost breakdown for a budget room of one of his hotels. Of note is that Naked exists in his budget room (which costs less than one third of DeHaan's room, $735 vs. $2300),18 much as it had in the Summit Hotel ten years earlier: the toilet and shower in a separate chamber and the one lavatory separate but adjacent and open to the rest of the room.19 This instance of Naked became the most prevalent in lower-budget hotels and motels and still exists in variations today. Through the 1980 decade there are few published instances of Naked in hotel bathrooms. The aforementioned configuration became the standard in budget hotels such as the Day's Inn, but received little attention due to its commonality and existence only in lower-budget establishments.20 As seen in the diagram, the sink shares space with where clothes are hung and becomes somewhat of a dressing area. This plan was presented in Hotel Planning and Design as the lowest cost option among other typical layouts employed in the industry in 1985. It is evident by the location of the bathroom to the rear of the plan that this room was intended for motels where rooms would be logically situated back-to-back for cost efficiency of plumbing. This example was the only configuration featured to bring a component of the bathroom outside of the bathroom chamber. Other, larger bathrooms of the time were moving toward compartmentalization of features such as the tub and the toilet,21 but they remained within the enclosed chamber of the bathroom. In Manhattan, The Mercer, a seventy-five-room five-star hotel, opened after much anticipation 1998 (the hotel was originally slated to open in the early 1990 decade, but faced several setbacks). The hotel was the creation of hotelier André Blazas and interior designer Christian Liaigre who together sought to create a clear alternative to the trendy, über-chic establishments of hotelier Ian Schrager and designer Philipe Stark24 (such as the Royalton and the Paramount). Speaking on this topic Blazas said, "'I wanted to create a hotel with an atmosphere of domestic bliss. It's the opposite of dictatorial. It's very important that when you go to a place you don't have to check your personality at the door. I mean, the purpose of design is to make you feel comfortable. Why should you feel onstage when you are in a chair? '"25 They succeeded in creating a boutique hotel that was not heavy-handed in its design or concept and that allowed guests to still be at ease while experiencing new ideas in hotel design. The Mercer featured large bathrooms that could be opened to the bedroom to create an open guestroom, or closed for privacy.26 In this instance having a Naked bathroom configuration was optional. The doors enclosing the soaking tub with the rest of bathroom could be opened to the bedroom and thus take advantage of the natural light and views. (This practice is popular and was later seen in other hotels such as The Standard (2008), also by Balazs, in its Deluxe King suites that have adjustable louvers that connect the soaking tub to the suite.) In other configurations in the Mercer, the entrance to the bathrooms utilized double doors that could be opened completely to create an open plan suite. In 1998, after ten years of work, Devi Garth hotel opened in the Aravali Hills of India. The hotel featuring twenty-three lavish suites was created through the conversion of great, but dilapidated palace built in the 18th century. Its opulent suites featured open plan configurations. As seen in the Lotus Suite, the spacious marble bathroom is only separated from the sleeping area by a freestanding vanity unit.27 No walls or doors physically separate the space, but arches help to define one zone from the other. In the 2000 decade the Naked aesthetic had become significantly more prevalent in boutique hotel design. The Emperor hotel (2007) in Beijing, a sixty-room boutique hotel designed by Graft, had suites defined by their open bathrooms. Utilizing the bathtub as a peninsula helped to define the bathroom zone of the suite from the sitting area.28 The toilet is located in its own compartment behind etched glass that is opaque for privacy. A year later, Urbn Hotel opened in Shanghai, planned as the first in a new chain of boutique hotels. Some of the hotel's suites featured baths that were not just in view from the bed, but actually adjacent to the bed on the same elevated platform.29 This structuring of Naked hierarchically elevates the bathtub to be on the same, highest plane of importance as the bed within the interior configuration of the hotel room. Bathing and sleep are both intrinsically connected with health, so it is understandable why both were given similar prominence in an interior. This, though, is one of the first examples of the two elements, the most significant elements of their traditionally separated respective rooms, being positioned so that they create their own zone. Q! Hotel (2004) was an earlier hotel that placed bed and bath adjacent to one another on an elevated platform. What began as a reconfiguration for efficiency in lower-end motels, has evolved into a competition of one-upmanship in the world's most exclusive designer hotels. Today the bathroom does not simply take up a corner of a guest room's floor plan, it becomes the room's main concept and dictates each room's unique configuration. The strategies belying the practice vary, but at their core, they all seek to provide the guest with an experience unlike any other. With the elevating of the bathtub onto the same platform as the bed as in the Urbn, or isolating it in front of bare curtain walls overlooking the river (and setting a scene for curious voyeurs below) as in The Standard, one can only wonder, "What's next?" 1) Intypes researcher, Mijin Juliet Yang, identified and named Naked in her boutique hotel study. See Mijin Juliet Yang, "Theory Studies: Contemporary Boutique Hotel Designs," (M.A. Thesis, Cornell University, 2005), 21-24. Ying's thesis included seven boutique hotels: D-Hotel  Arian Mostaedi; Osaka, Japan; Hotel Saint-James  Jean Nouvel; Bouliac, France; Sanderson  Philippe Starck & Anda Andrei; London, England; SIDE  Matteo Thun Design; Jan Störmer Architekten; Hamburg, Germany; Hotel Josef  Eva Jiricna Architects Limited; Prague, Czech Republic; Gran Hotel Domine Bilbao  Barcelona, Spain; ES Hotel  King Roselli Architelli; Rome, Italy. 2) The Naked intype was also identified in luxury apartments. Najung Kim, "Theory Studies: Archetypical Practices of Contemporary Luxury Apartment Design," (M.A. Thesis, Cornell University, 2009), 82-91. 3) Guestroom, SIDE Hotel  Matteo Thun, interior design; Alsop & Störmer, architecture; Hamburg, Germany in Anonymous, "Color Me Rad," Interior Design 72, no.12 (Oct. 2001): 286-93; PhotoCrd: Christoph Kircherer. 4) Masaaki Takahashi, "Three's a Charm," Interior Design 76, no.8 (Jun. 2005): 218-24. 5) Guestroom, Hotel Claska  Intentionallies, Interior Design; Torafu Architects, Urban Design System, Architecture; Tokyo, Japan in Masaaki Takahashi, "Three's a Charm," Interior Design 76, no.8 (Jun. 2005): 224; PhotoCrd: Jimmy Cohrssen. 6) From 2009 to 2010, Professor Jan Jennings conducted research about bathrooms in terms of Intypes (including Naked, Island, White Box, Scene Seen); museum display devices (vitrine, plinth and vignette); and Modernist characteristics which resulted in an interpretive article: Jennings, Jan. "Le Corbusier's ‘Naked': ‘Absolute Honesty' and (Exhibitionist) Display in Bathroom Settings." Interiors: Design, Architecture and Culture 2, no. 3 (2011): 307-32. 7) Guestroom, Sanderson Hotel  Philippe Starck, Anda Andrei, Interior Design; Anonymous, Architecture; London, England in Michelle Ogundehin, "Schrager's Edge," Interiors 159, no.9 (Sept. 2000): 84-89; PhotoCrd: Todd Eberle. 8) Intypes researcher Minjin Juliet Yang identified Showcase Stair in her 2005 boutique hotel design study. Showcase Stair is an extravagantly designed architectural feature in which the stair itself becomes a prominent display element. Its functionality is often secondary to the spatial drama created by the stair's structure, form, materials and lighting. Yang, "Theory Studies, 50-53. 9) Guestroom, The Standard  Todd Schliemann, Polshek Partnership, Interior Design; Todd Schliemann, Polshek Partnership, Architecture; New York City in "Gallery" http://www.standardhotels.com/new-york-city/rooms/ (accessed Mar. 2010); PhotoCrd: Anonymous. 10) Kim, "Theory Studies," 82-91. 11) Watson, Hotel Revolution, 10; Rutes, Hotel Design, Planning, and Development, 267. 12) Anonymous, in "Hotels Motels," Interior Design 32, no.10 (Oct. 1961), 143. 13) Guestroom, Summit Hotel  Morris Lapidus, Interior Design; Morris Lapidus, Harle & Liebman, Architecture Architecture; New York City in Anonymous, "Hotels Motels," Interior Design 32, no.10 (Oct. 1961), 151; PhotoCrd: Anonymous. 14) Anonymous, "Hotels Motels," 143. 15) Guestroom Floor Plan, "Room of Tomorrow"  Emily Malino, Interior Design; Emily Malino, Architecture; New York City in Anonymous, "Hotels Motels," Interior Design 32, no.10 (Oct. 1961), 154; ImageCrd: Emily Malino. 16) Anonymous, "1970 Rooms of Tomorrow," Interior Design 41, no.1 (Jan. 1970), 119, 120. 17) Guestroom Floor Plan, Suburban Motel  Norman DeHaan, Interior Design; Norman DeHaan, Architecture; New York City in Anonymous, "1970 Rooms of Tomorrow," Interior Design 41, no.1 (Jan. 1970),120; ImageCrd: Norman DeHaan. 18) Anonymous, "Public Spaces in Public Places," Interior Design 41, no.1 (Jan. 1970), 132, 135. 19) Guestroom Floor Plan, Sample Plan  Hotel Design, Inc., Interior Design; Hotel Design, Inc., Architecture; New York City in Anonymous, "Public Spaces in Public Places," Interior Design 41, no.1 (Jan. 1970), 132-135; ImageCrd: Hotel Design, Inc.
20) Guestroom Floor Plan, Day's Inn  Anonymous, Interior Design; Anonymous, Architecture; No Location in Walter A. Rutes and Richard Penner, Hotel Planning and Design (New York City: Watson-Guptil Publications, 1985), 172; ImageCrd: Day's Inn. 21) Rutes and Penner, Hotel Planning and Design, 172-173. 22) Benjamin Ivry, "Nouvel Hotel," Architectural Record 177, no.10 (Sept. 1990): 98-103. 23) Guestroom, Hotel Saint-James  Jean Nouvel, Interior Design; Jean Nouvel, Architecture; Bouliac, France in Benjamin Ivry, "Nouvel Hotel," Architectural Record 177, no. 10 (Sept. 1990): 103; PhotoCrd: S. Couturier/ Archipress. 24) Otto Riewoldt, New Hotel Design (London, England: Laurence King Publishing, 2002), 58. 25) Riewoldt, New Hotel Design, 58. 26) Suite, The Mercer  Christian Liaigre, Interior Design; Anonymous, Architecture; New York City, in Otto Riewoldt, New Hotel Design (London, England: Laurence King Publishing, 2002), 58-61; PhotoCrd: Todd Eberle. 27) Suite, Devi Garh  Rajiv Saini, Interior Design; Anonymous, Architecture. Rajasthan, India in Suzanne Trocme, "A Passage to India," Interior Design 71, no.8 (Jun. 2000): 108-117; PhotoCrd: Ken Hayden. 28) Suite, Emperor Hotel  Graft, Interior Design; Graft, Architecture; Beijing, China in Fred A. Bernstein, "Dynastic Ambitions," Interior Design 79, no.8 (Jun. 2008): 279-84; PhotoCrd: Hong Chao Wai. 29) Suite, Urbn Hotel  A00 Architects; Shanghai, China in Catherine Sole, "Letter from Shanghai," Interior Design 79, no.9, (July 2008): 279; PhotoCrd: Nacása & Partners. 30) Evidence for the archetypical use and the chronological sequence of Harlequin in hotels was developed from the following sources: 1960 Guestroom, Summit Hotel  Morris Lapidus, Interior Design; Morris Lapidus, Harle & Liebman, Architecture; New York City in Anonymous, "Hotels Motels," Interior Design 32, no.10 (Oct. 1961), 151; PhotoCrd: Anonymous; Guestroom Floor Plan, "Room of Tomorrow"  Emily Malino, Interior Design; Emily Malino, Architecture; New York City in Anonymous, "Hotels Motels," Interior Design 32, no.10 (Oct. 1961), 154; ImageCrd: Emily Malino. ; Bathroom, "Room of Tomorrow"  Emily Malino, Interior Design; Emily Malino, Architecture; New York City in Anonymous, "Hotels Motels," Interior Design 32, no.10 (Oct. 1961), 156; PhotoCrd: Alexandre Georges / 1970 Guestroom Floor Plan, Suburban Motel  Norman DeHaan, Interior Design; Norman DeHaan, Architecture; New York City in Anonymous, "1970 Rooms of Tomorrow," Interior Design 41, no.1 (Jan. 1970),120; ImageCrd: Norman DeHaan; Guestroom Floor Plan, Sample Plan  Hotel Design, Inc., Interior Design; Hotel Design, Inc., Architecture; New York City in Anonymous, "Public Spaces in Public Places," Interior Design 41, no.1 (Jan. 1970),135; ImageCrd: Hotel Design, Inc. / 1980 Guestroom Floor Plan, Day's Inn  Anonymous, Interior Design; Anonymous, Architecture; No Location in Walter A. Rutes and Richard Penner, Hotel Planning and Design (New York City: Watson-Guptil Publications, 1985), 172. ImageCrd: Day's Inn. ; Guestroom, Hotel Saint-James  Jean Nouvel, Interior Design; Jean Nouvel, Architecture; Bouliac, France in Benjamin Ivry, "Nouvel Hotel," Architectural Record 177, no.10 (Sept. 1990): 103; PhotoCrd: S. Couturier/ Archipress. / 1990 The Mercer  Christian Liaigre, Interior Design; Anonymous, Architecture; New York City, in Otto Riewoldt, New Hotel Design (London, England: Laurence King Publishing, 2002), 61; PhotoCrd: Todd Eberle; Suite, Devi Garh  Rajiv Saini, Interior Design; Anonymous, Architecture. Rajasthan, India in Suzanne Trocme, "A Passage to India," Interior Design 71, no. 8 (Jun. 2000): 115; PhotoCrd: Ken Hayden / 2000 Guestroom, Sanderson Hotel  Philippe Starck, Anda Andrei, Interior Design; Anonymous, Architecture; London, England in Michelle Ogundehin, "Schrager's Edge," Interiors 159, no.9 (Sept. 2000): 87; PhotoCrd: Todd Eberle. ; Guestroom, SIDE Hotel  Matteo Thun, interior design; Alsop & Störmer, architecture; Hamburg, Germany in Anonymous, "Color Me Rad," Interior Design 72, no.12 (Oct. 2001): 293; PhotoCrd: Christoph Kircherer. ; Guestroom, Hotel Claska  Intentionallies, Interior Design; Torafu Architects, Urban Design System, Architecture; Tokyo, Japan in Masaaki Takahashi, "Three's a Charm," Interior Design 76, no.8 (Jun. 2005): 224; PhotoCrd: Jimmy Cohrssen. ; Suite, Emperor Hotel  Graft, Interior Design; Graft, Architecture; Beijing, China in Fred A. Bernstein, "Dynastic Ambitions," Interior Design 79, no.8 (June 2008): 284; PhotoCrd: Hong Chao Wai. ; Suite, Urbn Hotel  A00 Architects; Shanghai, China in Catherine Sole, "Letter from Shanghai," Interior Design 79, no.9, (July 2008): 279; PhotoCrd: Nacása & Partners. ; Guestroom, The Standard  Todd Schliemann, Polshek Partnership, Interior Design; Todd Schliemann, Polshek Partnership, Architecture; New York City in "Gallery" http://www.standardhotels.com/new-york-city/rooms/ (Mar. 2010); PhotoCrd: Anonymous; Guestroom Floor Plan, The Standard  Todd Schliemann, Polshek Partnership, Interior Design; Todd Schliemann, Polshek Partnership, Architecture; New York City in "Hudson Studio" http://www.standardhotels.com/new-york-city/rooms/ (Mar. 2010); ImageCrd: Anonymous.